Gordon Hatfield is half-Maori and half-European, but strongly identifies with Maori traditions. He feels that being of two heritages led him at an early age to question and find out more about Maori art and customs. According to Hatfield, gangs in the 1970s and 80s led to the resurgence of moko. Youths would wear moko on their faces as monikers of gang membership. Now those with moko on their faces could easily be managing directors of corporations, since moko has become both increasingly popular and a signifier of Maori pride and tradition rather than a symbol of rebellion. Hatfield started out as a wood carver and then made the transition to moko; a common practice with historical roots. After moko was outlawed by the Europeans, the traditional forms were translated to woodcarvings. Hatfield believes this transition to the 'timber' shaped modern moko by making the art more humanistic, in that carvers are taught to represent the stories and the traditions of his people in the wood, bone, stone and other various mediums. 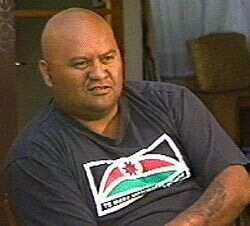 Chaz Te Puehu is a Maori artist with Tuhui and Napuhi tribal affiliations. He has been doing moko and other components of Maori art for six years. According to Te Puehu, moko is his skin. He feels it carries his values, beliefs and philosophies. Despite all the different tribes of the Maori, Te Puehu says moko is a common denominator  a tradition that unites his people. The intersecting histories of moko and English colonization in Australia and New Zealand interests Te Puehu, and is an important factor in why he practices the art. Before English settlers came to the region, all Maori people had moko on their arms, legs, bodies and especially their faces. During wars, the heads of fallen warriors were taken back to their tribes for remembrance. English missionaries viewed this as a barbaric practice and encouraged the halt of moko. English traders saw the ornate moko heads as curios, and bought them back to Europe to display. This desire led to the murder of many Maoris with elaborate moko on their heads. Soon many Maori ceased getting moko for fear of their lives. According to Te Puehu, this led to the demise of moko at the time. He regards the recent resurgence of moko and Maori art as a reassertion of Maori values, and hopes it will raise awareness to issues that plague the Maori such as alcoholism, poverty and crime. Trained as a painter, Christine Harvey first dabbled in tattoo when she was a teenager. She got involved in moko as she become more interested in her Maori heritage. To Harvey, feels the difference between tattoo and moko has to do with the fact that moko has a geneology and a heritage, whereas tattoo is just a picture. Inspired by the work of Gordon Hatfield, she bought a machine with a power pack and other equipment from the artwork that she sold in the gallery. Within a year, she had enough equipment to start doing moko work. Recently, Harvey is trying to use traditional hand tools, and designing them herself in order to get the proper effects. Most of the people Harvey works on are Maori women, because they often have a preference to be worked on by a woman. Until recently, she says there was a taboo about women getting moko done, since it was viewed as a masculine thing. As more women get involved in moko as artists and as more women are rediscovering their heritages, she feels these gender ideas will break down and more and more women will become involved with it.